Why on earth are some nursery rhymes so ruddy horrible? 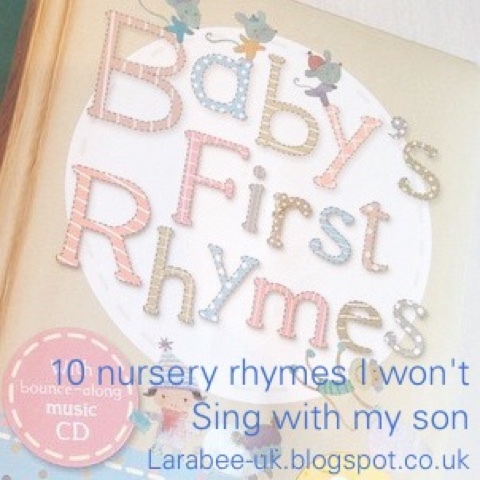 Yes those sweet sounding rhymes which sound so cute sung by your little one, but have you ever listened to the words? Some of them are pretty awful, and if that's not bad enough most nursery rhymes and historical or political meanings behind them which are really unpleasant. Have a look at this article for more about that. I'm a big wuss when it comes to animals and do not think any form of animal cruelty is acceptable and do not want my son singing about it, same goes for any type of abuse, however most of these comments are somewhat tongue in cheek even if it is true that they are not sung in our house! 1. Three blind mice - a farmers wife cutting off the tails of mice for no apparent reason, bizarre! 2. Tom Tom the farmers son - his pig was eaten and he got a good hiding, well I'm all for a bit of punishment where needed, but do we need to sing about the poor kid getting a pasting for trying to liberate a pig? 3. Jack sprat could eat no fat - portraying that all women are fat, must have been written by a man! 4. 5 little Ducks went swimming one day - about a family who's children run off, yeah entertaining! 5. This little piggy went to market - nuff said. 7. Old mother Hubbard - her poor little pup couldn't eat because the cupboard was bare. 8. There was an old woman who lived in a shoe - 'she whipped them all soundly and sent them to bed', need I say more? 9. Ladybird, ladybird fly away home - the poor ladybirds house is on fire and she's lost her children, so sad. With silver bells and cockle shells and pretty maids all in a row. Much nicer to hear your bewt singing sweetly about pretty flowers... or are they?? This couldn't possibly be a song about Mary I and instruments of torture, could it?